I know that when I moved here I was in love with you. I really was – I’d come from darker places, and you seemed truly stunning in comparison. But I’ve matured and grown and been out to see the world. Maybe I’m shallow, but I’ve looked beyond the horizon and I can’t forget what’s there. And then there’s the way you treat me. Where once I thought you kind to me I now see that you didn’t really care for me at all. I know that you do your best to tolerate me, but really that’s not the same thing at all. I have to tell you that I just don’t love you like I used to. I once thought that change was just around the corner – but I don’t believe that now. And I do know that you’re trying to change – in many ways you’re trying quite hard – but you’ve not really committed yet. You’re still trying to hold on to the old-you – you’re trying to change and not change both at the same time. So far the new-you is not all that much more than a glossy front covering over the old-you – and you know yourself that in places it’s really not that glossy either. Don’t get me wrong – some of the change is to be welcomed. Some of it is helpful. There are glimpses of something different where there were none before. But this isn’t real change, and it’s oh so incredibly slow. Once or twice you’ve made a real effort – but each time you succeed with what feels like a tiny (if important) first step you seem to rest on your laurels, feeling that the job’s just about done. Perhaps real change is coming – but where once I thought I’d benefit directly, now I’m wondering if I’ll live long enough to see anything significant happen at all. So the truth is that my heart is now promised to other cities, other towns – places that treat me like a full human being even when I’m just a temporary visitor. Cities that started to change decades ago, which worked out that to stay beautiful, to stay healthy, they needed to throw away ideas of a bright but entirely metallic future which had once seemed so alluring. And you know what really did it? What made me really fall in love with these places. It’s that despite being decades ahead these places continue to make improvements every year which are greater than anything you’ve done in decades. Step by step they continue to develop into healthier, more beautiful, more vibrant places. Well I know that you know that I use a bike, and you’re probably thinking that I’m going to ask you to be pro-cycling and pro-cyclist. But you’re so so wrong. That you see the world this way – where ‘cyclists’ and ‘cycling’ is a separate thing from the very fabric of life – is part of why I don’t love you any more. If you really do want to understand then consider this: The places I now love aren’t so much pro-cycling as pro-human. They treat their citizens as people, with a rightful place on the street, not as animals to be herded, not as something which gets in the way of the important stuff. They see that people ARE the important stuff. They see a person on foot, a person cycling, as the life and soul of the city… and motorised vehicles as something that might need to be tolerated in places – a necessary evil, a tool with a definite role to play, but they don’t equate noise and fumes and wide stretches of black tarmac and the smell of exhaust with progress any more. In these cities I feel like I have a full right to be on the street whether I’m on foot, on a bike, or just standing on a street chatting. Those things are seen as valid uses of the street. You think that you see the world that way too. You have policies and pronouncements which say that you see the world that way. But these are just words and they bear little relation to the truth on the ground. The cities that I now love have made these things happen already. Local customers, local shops, thriving town. And before you start on that ‘share the road’ stuff, or tell me that I’m anti-motor-vehicle or anti-car or anti-driver just don’t bother. Did you notice that Waze recently declared that the Netherlands was the best country to drive in? Let that sink in why don’t you? The country where cycling is easiest and safest, where motor traffic in towns and cities is more controlled than anywhere else, is the best one to drive in. Not just ‘OK’ to drive in but the ‘BEST’ to drive in. So I’ve said my piece. Maybe you can still learn? I never give up hope. This place really has the potential to be such a stunning location. It pulls tourists in from the other side of the planet after all…. So let me tell you this to finish. When I visited Amsterdam for the first time I thought I’d be staring open mouthed at the cycle tracks. I thought that I’d come back home with lots of photos of these – with lots of learning about what a good cycle track looks like. I didn’t. The cycle tracks were great, and I did bring back some photos – but in the end they’re just bits of stone and paint. What I actually carried home with me were things that had registered in my heart, not my intellect. This is just a photo of a car waiting for two people to cross, but what really matters is that it’s out of the picture. It’s out of the photo – but that’s not what I mean. While these people crossed it was ‘out of the picture’ in every other way, in the background, irrelevant and quiet. I have a memory of a children’s play park in a spot where once people would have parked cars. I have a video of a major junction where movement never seemed to stop – where there was traffic passing in all directions, but where queues were tiny, and waiting times brief. I remember seeing friends talking on the way home, where shared routes meant an opportunity for chatter, despite them being in different vehicles heading to different destinations. 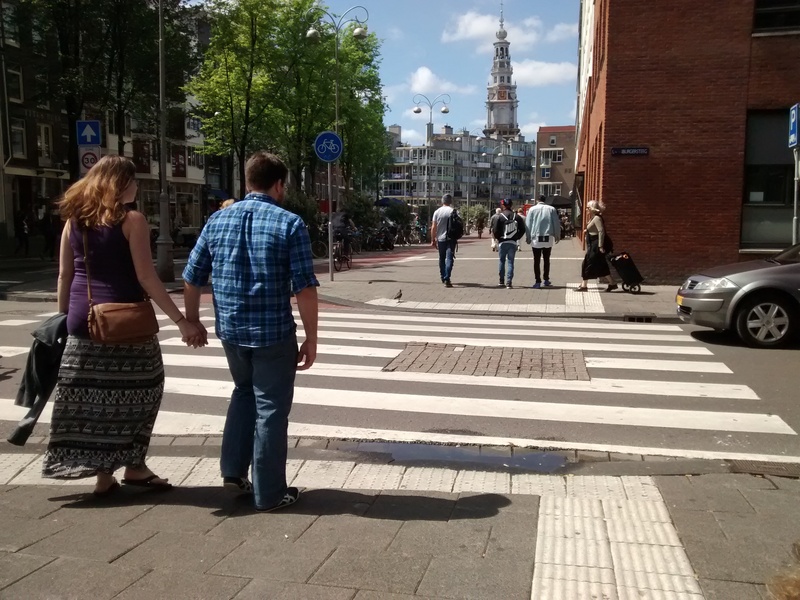 There are images of young couples holding hands… while cycling efficiently around the city. And there’s the realisation that once cycling with a passenger is made safe then bicycles can be used to offer a lift to a friend. With these things the whole nature of cycling changes absolutely. There’s the image of one adult accompanying a whole group of children – popping down to the shops with them, but without a car. There are small towns which still had shops. Then there was the moment when, on a trip out of the city, we had a woman stop her car to let us cross a major road. This was just a simple gesture, absolutely the same thing as happens between those driving here. A moment of common politeness. But we weren’t driving. We were on bikes. And then finally there’s the quiet. The wonderful peace. Here’s a key road 5 minutes after rush-hour close to the very middle of Amsterdam. And that’s not to say that rush hour had been noisy by the way. In Amsterdam I could hear my children talking to me.